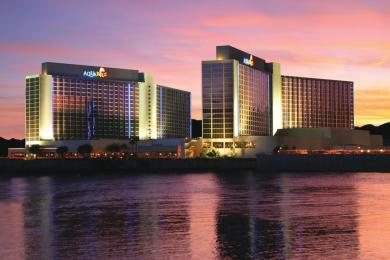 The Sunset Suite Special includes a $20 FREE Slot Play Bonus. $119.99 (plus tax) per night Sunday through Thursday and $199.99 (plus tax) per night Friday and Saturday. When you book this special - you will receive the following additional offers - a savings of over $50: 2-for-1 Buffet at Windows on the River Buffet*, 2-for-1 Bud/Bud Light at any Aquarius casino bar, 10% off Cruise on the Celebration boat (limit 2 per coupon). Offer available now through December 24, 2019. Restrictions on special offer apply. Blackout dates apply. Limit of 2 people per coupon. Book Online Now, or call 1-800-662-5825 and mention the Sunset Suite Special.